Peugeot has released images of the all-new Peugeot 508 ‘fastback’, ahead of its official launch at the Geneva Motor Show 2018. The swoopy and stylish saloon will go on sale in the summer, with prices expected to start in the region of £26,000. Given Peugeot's emphasis on SUVs, like the impressive 3008, the French carmaker might have been forgiven for giving up on large saloons. The old 508 was never a huge seller and always struggled alongside its German rivals for kerb appeal. 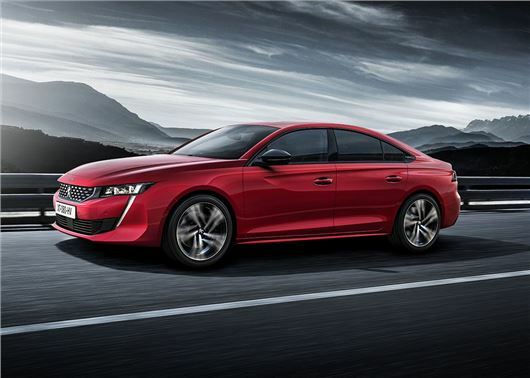 However, with the all-new 508, Peugeot claims it’ll ‘shake up’ the executive car market with improvements in quality, comfort and a radical new ‘fastback’ design. The new 508 certainly looks imposing from the computer generated images that Peugeot has released, with an aggressive front design that features sweptback LED headlights and a huge upright grille. The slung back look is complemented by frameless doors and wheels have been designed to fill the entire wheelarch housing. Available with a range of petrol and diesel engines, covering 130PS – 225PS, the 508 is being billed as a much more driver oriented car - which is just as well as the outgoing model was never the most involving of things to guide across a challenging B road. The bumpy ride quality also left much to be desired. Inside the 508 gets the latest digital i-Cockpit system, with the traditional instrument binnacle replaced with a 12.3-inch screen that can be customised with maps, route directions and in-car data. A 10-inch colour screen will dominate the minimalist dashboard and the layout will mirror the 3008 with neat aircraft-styled switches providing useful shortcuts to all of the touchscreen controls. There should be plenty of space for four adults to fit comfortably, while the 487-litre boot should provide lots of everyday practicality for company car drivers and family buyers alike, with a wide opening and 60/40 split rear seats. Peugeot’s flagship model will also come equipped with an array of semi-autonomous driver assistance tech that include a new night vision system that'll use an infrared camera to detect pedestrians at night, and apply the brakes automatically should they step out in front of the car. On sale from July 2018, the new Peugeot 508 is expected to command slightly more than the old car's £25,340 starting point. However, for a model that looks anything like the computer generated images, we'd wager than mid-spec models will command in excess of £30,000.